Columbia Pictures and executive producers Robert Zemeckis and Steven Spielberg present "Monster House," an exciting and hilarious thrill-ride tale about three kids who must do battle with a mysterious house that threatens anyone who crosses its path. Steve Buscemi, Nick Cannon, Maggie Gyllenhaal, Kevin James, Jason Lee, Catherine O'Hara, Kathleen Turner and Fred Willard are among the stars lined up for "Monster House." Joining them are newcomers Mitchel Musso, Sam Lerner and Spencer Locke. Steve Starkey and Jack Rapke of ImageMovers are producing with executive producer Jason Clark. 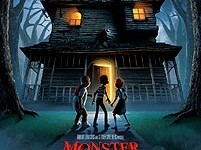 "Monster House" is directed by Gil Kenan, the UCLA Spotlight Award-winning director of the live-action/animation short "The Lark." The film is written by Dan Harmon & Rob Schrab and Pamela Pettler. The digital animation is by Sony Pictures Imageworks.